While there is still much research to be done, treating people who suffer from addiction and PTSD with EMDR has shown positive results, and the treatment is being studied more in depth. Evidence supports that use of EMDR, along with typical addiction treatment, can reduce negative feelings that come with addiction and the chance of relapse. Eye Movement Desensitization and Reprocessing (EMDR) therapy is the practice of helping someone’s trauma through sporadic visual stimulation. Generally speaking, it seems that there is a relation in the rhythm of someone’s eye movements, similar to when they enter REM sleep, and the association of the traumatic memory. Having patients recall those memories, similar to most therapy, while stimulating their vision can help reprocess how that memory is stored and reduce the intense feelings associated with that memory. Today, many treatment centers provide EMDR in help with addiction. However, that doesn’t mean all of them do. If you think EMDR is something that may help you or someone you love, make sure to be on the lookout for it. Sometimes, finding the right rehab is all about finding the right treatment. While no one knows exactly how or why EMDR works in the brain, there is evidence that reinforces its usefulness. For some reason, these eye movements are able to dampen the feelings associated with emotionally charged memories or trauma. This has shown positive signs in people who suffer from PTSD. As it so happens, PTSD is one of the most common root causes of addiction and more treatment centers are investing in treating a patient’s co-occurring disorder than ever before. The popular belief is to treat one’s addiction at the root cause to not only help them recover but to prevent them from relapse down the road. When going into EMDR therapy, there is no medication involved. It is done completely through the use of visual stimulation. This is a positive for people who may not take well to medication or are at high risk for abusing another substance after going through detox. While there is equipment that has been specially designed for the use of this therapy, many therapists still use a pen. There is no strict evidence that one method is better than the other and it seems to be a case of personal preference. While this therapy may seem simple, it is not something that should be attempted at home. Proper use of this treatment means talking with the patient and bringing up their past, traumatic memories. Not only is this a painful process, but it can trigger intense feelings and erratic behavior as they relive those moments. Not knowing what you’re doing in this treatment can lead to someone relapsing or worse. How Can EMDR Help Treat Addiction? The use of EMDR in addiction treatment results in the fact that a lot of addiction is tied to a past trauma. The belief is by treating this trauma, the person suffering from addiction will have less of a compulsion towards substances. Therapists using EMDR therapy approach a patient’s addiction from a trauma-informed perspective. This allows them to examine each case as an individual and look at the root cause and contributing factors to each person’s addiction. Because of this, EMDR is able to play a central role in addiction treatment. Many people who suffer from substance use disorders have diagnosable PTSD. This makes EMDR as a front-line therapy a logical choice that can greatly help a patient and reduce their risk of relapse. How EMDR Can Help Treat Addiction Memory? More and more, people aren’t becoming exposed to addictive substances as a result of deliberately seeking them due to some kind of traumatic experience. Rather, they are becoming addicted due to a physical injury that requires them to take an opioid. 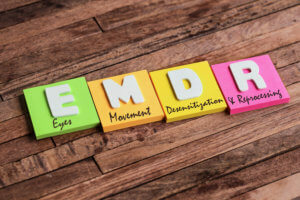 While EMDR may not be helpful in treating them in this case, they can still benefit from it if they are dealing with something called an addiction memory. An addiction memory is a general memory of loss of control or a drug-specific memory of the drug’s effects. It is this memory that leads to continuous drug-taking behavior and can hold someone back from recovering. In the same way that EMDR can dampen the feelings that come from past trauma, they can dampen the intense feelings that come with addiction memories. One study shows that incorporating EMDR into treatment as usual, (TAU), can greatly improve the sufferer’s chances at long-term recovery. Incorporating EMDR into TAU also demonstrated a decrease in symptoms of depression over people who only received TAU. If you or someone you love suffer from addiction and have failed at recovery in the past, you may find benefit in EMDR. More and more treatment centers are offering EMDR as a way to treat the underlying causes of addiction. If this is something that you think you may benefit from, or you are unsure about, then reach out to a dedicated treatment specialist. They are available around the clock to help put your nerves at ease and answer any questions you might have about the process of recovery. They can even help you find the right rehab for you.